London has been central to world music for a very long time. From rock bands to symphony orchestra’s London has created some of the most iconic bands to date. In the 70’s and 80’s there were many rock bands that are now legendary within music, such as Led Zepplin, Wham!, T-Rex, The Pistols and David Bowie. They were fast becoming the biggest groups in the world. Since these iconic rock bands, possibly the most well known band around in the 21st Century are Coldplay who sold out their tour at The Emirates stadium. They have become huge not just in the UK but also the world, starting life in London. The Beatles who were from Liverpool spent a lot of time creating and writing music in London. There are now a different style of artists and musicians from London, most famously Adele, Jessie J and David Bowie. These are more of the pop bands that are making headlines across the world. There are many venues in London which host some of the best gigs in the UK. The biggest ones are the O2 Arena, Hammersmith Apollo, Shepard’s Bush Empire, Alexandra Palace, Royal Albert Hall and Wembley. Those venues have welcomed some of the biggest stars. Recent acts to perform are Take That, Girls Aloud, Justin Bieber and the ones coming up are Mcfly, Alicia Keys, Kings of Leon are performing in their upcoming tours. The O2 arena in London is certainly one of the biggest venues in London and hosts some of the biggest events in the UK. The North Greenwich arena was built in 2007 and has a capacity of 20,000 depending on the event. The O2 arena was built in 2000 as the Millennium Dome. The Millennium Dome, however, faced a lot of political controversy and recurrence financial problems. The Dome was officially renamed O2 arena in 2005 and redeveloped until 2007. The redevelopment cost £600 million. The opening was celebrated with a huge Bon Jovi concert. Today, the O2 arena hosts some of the biggest events in the UK. The arena hosts everything from concerts, award ceremonies, boxing, basketball and tennis. In 2013, the O2 arena will host gigs such as Beyoncé, Michael Bublé, Bruno Mars and Barbra Streisand. The Royal Albert Hall is probably one of the oldest and more prestigious venues in London. The venue, based in Kensington, hosts some of the best rock and pop, ballet, opera and classical concerts in London. Artist like Eric Clapton, Mark Knopfler and classic genius Lang Lang are regular performers at the Royal Albert Hall. It also holds the BBC Proms every summer since 1941. The venue was built in 1871 and was supposed to be named as the Central Hall of Arts and Sciences, However, Queen Victoria renamed it to Royal Albert Hall of Arts and Sciences. The Royal Albert Hall was renovated between 1996 and 2004. The project improved ventilation and seating and also new bars and restaurants in the venue. 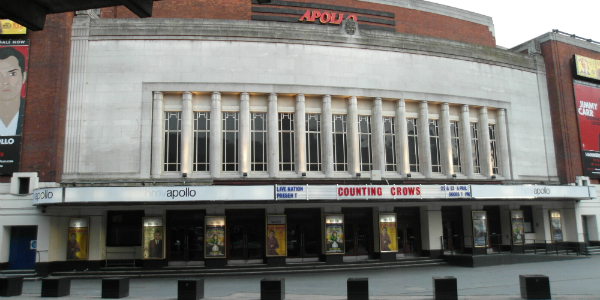 The Hammersmith Apollo is one of the most charismatic venues in London. The venue is based in Hammersmith and was built in 1932. The look and size of the Apollo, which only holds a capacity of 5,000, make every event special. Over time, the Apollo changed it’s name several times. The venue was built in 1932 as the the Gaumont Palace cinema and seated 3,500. It was designed by Robert Cromie in a specific Art Deco style. The building was renamed in 1962 to Hammersmith Odeon and had the nickname “Hammy-O.” In 2000, again it was renamed to London Apollo. However, the HMV Group bought additional shares in 2009 which resulted in naming the venue HMV Apollo from 2009 to 2012. The venue was sold to AEG and Eventim in 2012. 2013 will again be a special year for the venue and many artists already announced their gigs at this special venue such as Jimmy Carr, Lana Del Rey, Micky Flanagan and Ben Howard. The Shepards Bus Empire is one of the smallest London venues, but just like the Hammersmith Apollo, it’s one of the best. The Empire was built in 1903 and only holds a capacity of 2,000. The intimate atmosphere is very special and it feels like the artist is right in front of you. The venue was built and designed by theatre architect Frank Matcham in 1903 as a music venue. Some of the biggest artists performed at the Shepards Bush Empire such as Charlie Chaplin and Rolling Stones. However, the music and entertainment business declined in the early 50’s and the venue was bought by the BBC, renamed BBC Television Theatre and used as a television studio–theatre. The BBC left the building in 1991 and entrepreneur Andrew Mahler invested £1 million to refurbish the venue. In 1994, it reopened as the Shepards Bush Empire. In 2013, the venue mainly holds rock, alternative and indie events such as One Republic, Rascal Flatts and Laura Mvula.